Getting back into the rhythm of anything can be hard. Yes, you can not ride a bike for a decade, get back on, and probably be fine. But chances are good you’ll drop it on a tight turn, over brake somewhere, or run into a stop sign in a sheer panic. The rhythms of recovery for me are always difficult to attain in regular training cycles, let alone when I’m getting back into shape. So, it comes as no surprise to me that this week, which is shaping up to be my heaviest week in some time, I totally forgot about one of my go-to recovery tools: compression sleeves. Look, I’m not going to lie to you about compression, mostly because I don’t need to. I don’t need to sell you anything. The fact is, the science of compression is way conflicted, and far from definitive. In theory, the compression sleeve constricts the blood vessels in the calf, generating a higher local blood pressure, and thereby increasing the blood flow. Increased blood flow is good because that’s what we need to recover from hard training. When tissue blood flow decreases, problems start. Micro tears don’t heal, cells don’t get fed the necessary nutrients to function properly, and so on and so forth…compression has been in use on the medical side for a long time, but made its way into running over the past few years when companies who previously were limited to overcharging diabetics with circulatory issues, realized a market niche existed within the athletic world (OK, not an objective fact, but certainly a plausible hypothesis). The market has blown up, and every athletic apparel company has their child labor pool hard at work throwing compression-related apparel together. I started wearing compression sleeves during my pre-Grandma’s training cycle. Not because they were was a convincing reason to, but there certain wasn’t a convincing reason not. When you’re putting in 90-100 miles a week, consuming every form of calorie you can get your sweaty fingers on, and sleeping like an infant; you’ll take whatever you can get if you even remotely suspect it might aid your recovery. So picked them up, and wore them after long runs and hard workouts. I wish I could tell you that my recovery was appreciably faster, but I didn’t really notice too much. I still had heavy legs the day or two after long runs, and still hurt after a hard workout. So why would I continue to use them? Well, for one, they feel good, and comfort is an overlooked aspect of recovery. Comfort allows you to relax. Being relaxed allows your body to function within norms. A body functioning within norms rapidly identifies what needs to be healed and does so. My other reason for wearing them is akin to Kierkegaard on God: in the absence of certainty, I’ll err on the side of caution. Caution in this case would be the hoped-for scenario in which the compression sleeves are actually doing what they advertise. 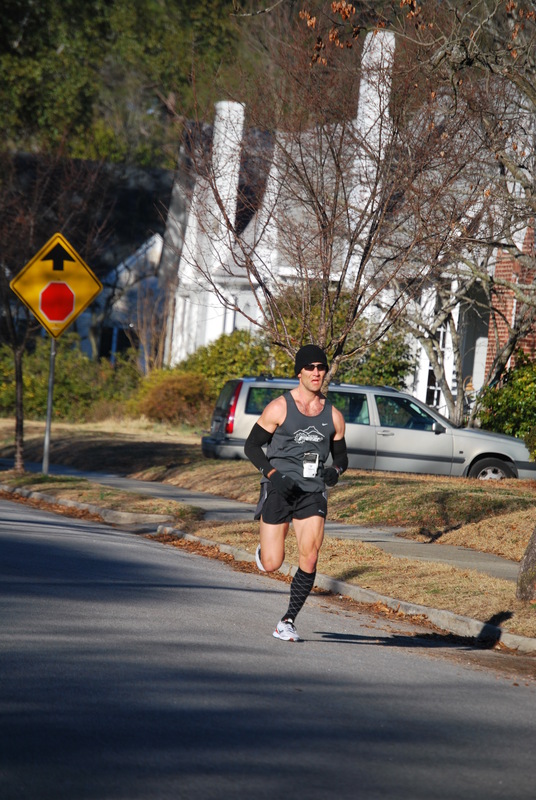 Speaking of which, check out the Zensah site for the ones I wear. They’ll set you back about $40. Making compression look good...but I still had a disappointing race. Yesterday post-tempo run, I was getting changed to grab dinner and saw my Zensahs in my drawer. The light finally went on, and I donned those bad boys. In fact, I’m wearing them right now, as I type and get ready for my morning run. Who knows – maybe if I’d been wearing them all week, my legs would have felt much better yesterday? I have been considering Compression socks for a while…I may in fact have to make a quality purchase … Thanks for the gear review Matt! !